Ok, yes, I admit: I finally joined the Twitter fever, and I am in fact enjoying it. All for higher research purposes only, of course. Ahem. Anyway, in this post I’d like to share with you some of my first findings/impressions about being a (still newbie! :) ) Twit. So, as you probably know by now, Twitter is a simple web sites that keeps asking you and everyone else one simple question: What are you doing? And yes, people from all over the world answer this same question (in 140 characters or less) several times a day, and read answers their friends, acquaintances, or strangers (it’s the Internet after all!) provide. Many are wondering at what makes people Tweet, but as with most Web 2.0 phenomena you can’t really know/understand what it is all about until you give it a try (and I mean really give it a try by actively participating!). Here are some of my ideas of why Twitter works. Actually, answering the question “What are you doing?” on the web is not a new idea. It’s been around for years in different communities; I think that most (if not all) of the forums I used to participate in had an always popular topic “What are we doing right now”, in which members would post short (one sentence) answers. These topics were always a great way to kill time, but also to build a special connection between forum members and strengthen the forum community. In these topics you were could read small little details about members’ lives - their passions, dreams, joys, frustrations and what not - and you got the feeling that you knew them a little better. But of course, these “Tweet topics” were constrained to a certain web place - the forum - and people get restless if they are limited to one, same old, same old place. Especially because you can’t ever find all of your friends and other interesting people in just one place! And I think that’s where the folks at Twitter got a brilliant idea and offered the users the power to connect socially across different places. Sure, you still have to get a Twitter account, but once you get that, you can Tweet from anywhere you like - the Twitter web site, other websites, your IM client, your browser, your dashboard, your Second Life, your mobile phone,… and you can also read Tweets from your friends from any place you like! You are no longer limited to one application, one website - and I think we’ll be seeing more of that in the future of the Internet. For this reason Twitter is the ultimate social network - anywhere, anytime. Saying “I have to go out” is usually the end of an IM conversation, but can be a start to a Twitter one! Once you set it Twitter up and find your friends, you just enjoy the ride and get connected with your social network - and along the way you can of course discover interesting Tweets from your friends’ friends and expand your social network. Speaking of differences between Twitter and IM: people often ask why is Twitter different/better than IM? I think Twitter has some advantages over using IM. Firstly, it is not as time demanding, because you usually aren’t expected to reply immediately (although you easily can if you want to), and it takes away less time than having 10 separate IM conversations. But still - you are up-to-date with what your friends are doing, and can provide feedback if needed. And although Twitter can also be disruptive, I think it is very easy to turn off notifications when you need to concentrate on doing something - and nobody actually knows you aren’t receiving notifications (unlike with IM when your contacts know when you’re offline). One of my Twitter friends anyaixchel found a perfect word to describe the communication process on Twitter: ambi-synchronous. I find Twitter communication really fascinating. It is very simple, but yet it connects people in an almost magic way. And again - I think its main advantage is that it is not limited to one single place, but is in a way universally accessible no matter where you are. And because of that characteristic I believe that Twitter can be used in many different ways: as a travel journal (the expenses of sending an SMS on the road are often much lower than trying to find a computer with internet access in some places), as a flash news feed (see example), as an event reminder, as a tool for class notifications (I wish we had Twitter when I was in school! ), and many more. The Twitter mania is just starting, so I’m sure we’ll all be able to find many other innovative usages of this new tool. By the way: Twitter is not the only bird on the block. One interesting (and great looking!) 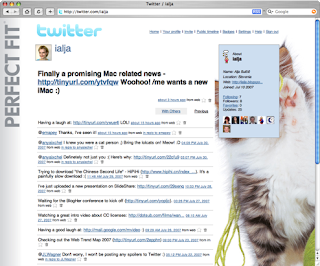 variation of Twitter is for instance Jaiku, which is also great for aggregating different feeds you might have (blog, Flickr, del.icio.us etc). Have a look at my Jaikus for an example. Unfortunately Jaiku doesn’t (yet) support IM notifications, and so it is not as place independent as Twitter.